The Season is Short ! All Items Listed are in stock for immediate shipping. Same day shipping on all orders received by 12 noon. Zone 2 customers should receive their orders the next day. Zone 3 & 4 usually require an extra day of delivery time. 2017 Marks our 32nd Year in Business, and it has been a good growing season in New York thus far! The New York Christmas tree crop appears to have weathered well given the two back to back harsh Northeast winters. As many of you know Garry Henderberg, a good friend and industry leader in the Christmas Tree and Wreath Business passed away this spring. Gary had always helped us with wreath making sessions at BTF’s “Supplier’s Open House” as well as many CTFANY winter and summer meetings and was twice president of the association. He truly enjoyed working with people, showing them how to select the right greens, and make that perfect wreath. His talents, smile, and good-natured humor will surely be missed. We are still primarily using United Parcel Service for deliveries, but will also use USPS priority mail flat rate boxes if it is more cost effective. As usual, your order will be packed and shipped in the most economical manner. 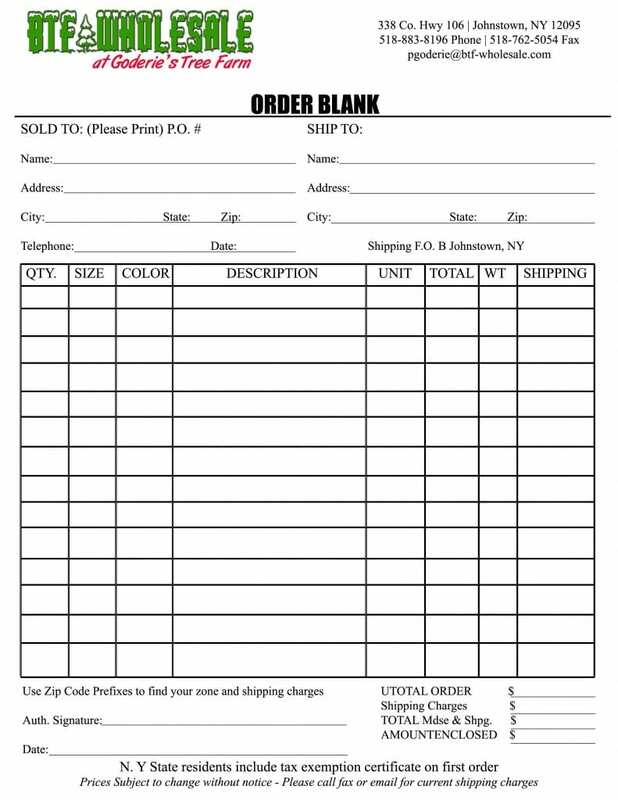 Call, email or fax BTF-Wholesale and we can give you current shipping charges for your order. If you are in the area we encourage you to stop in and pick up your order and save on the freight charges. We will also deliver products at no charge to any of the trade shows that we are attending. Please call or check our web sites for a current list. The one thing that has been consistent over the years is the BTF-Wholesale has become a conduit for growers, sellers, and buyers of Christmas trees and greens in the New York/New England area. If you are looking to buy or sell trees or brush, let us know early in the season and we shall be glad to pass this information along to the interested parties. We do not get involved with the quality or price, just try and put the right parties together. We would once again ask everyone to place their orders as early as possible, even if you have a later shipping date, as many suppliers are choosing not to carry large inventories. It is very difficult to restock items late in the season. We appreciate any feedback, as well as any suggestions, for new products to carry and will continue to provide the same prmpt service you have come to expect. As always, we would like to wish everyone a happy and prosperous Holiday season and we look forward to hearing from you or seeing you in person. Sundays 10:00 AM – 4:00 PM. Orders may be picked up year round if prior arrangements are made. or by check or money order in advance. We do not ship C/O/D. A $30.00 service fee will be charged for any returned checks. If you would like to open a B.T.F. charge account, please request a credit application. Late payments will accrue a 2% interest per month on all charges not settled according to terms. Please allow 2-3 weeks to process your application. New York residents must have a N.Y. Farmers exemption or resale certificate on file in our office. Most items are shipped UPS. All orders will be packed the best way to save on freight. Unless stated otherwise all prices listed are F.O.B. Johnstown, NY and are current at catalog publishing time. Some items may sell out and prices may differ at time of reordering, therefore we maintain the right to change prices. We will notify you of any price increase before shipping. Please request a return authorization number within 15 days of delivery on any merchandise to be returned. No returns will be accepted without a R.A. number. You will be assessed a 20% restocking fee and be responsible for return freight charges. IF HOWEVER, you receive defective merchandise, you will receive a full refund including freight charges. No returns will be accepted on partial returns of quantity priced items or on any items picked up by you or your agent at our sales location, unless the merchandise proves to be defective. Returned items must be in original package and in unused condition.